Basic electricity for boat builders, boat repairers and owners. What you need to know about the electrical systems on your boat. Working on AC Circuits, safety, good practices. Videos, Basic wiring techniques. The first, most important thing when installing electrical systems is Safety! Wear Rubber Sole Shoes: Insulate yourself from the ground. Never work with wet hands or while standing on a wet surface. Do not use power tools that have frayed, cracked or melted cords. 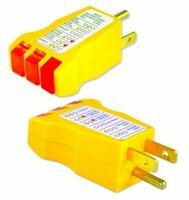 Use good quality industrial grade cords of at least 20 amp rating. Do not use household (two wire) extension cords. They do not have a third green grounding wire so you are not protected from shock if you accidentally contact a live circuit. Buy good quality tools. Why pay more? Quality tools are almost always guaranteed by the manufacturer. They perform better, last longer, and rarely break, and some will be replaced free. Cheap tools will break and can injure you when they do. Again, it's all about safety. This is just as true of electrical tools as it is of wrenches, hand tools and power tools. If possible buy hand tools that have insulated handles. For instance, adjustable wrenches, screwdrivers and pliers. They should be insulated so you do not accidentally contact a live circuit and ground at the same time causing a short and a shower of sparks. Electrical tools, such as drills and soldering guns should be double insulated. This prevents you from being shorted to ground and getting a nasty shock. If possible use cordless, battery operated tools. They are safer than AC powered tools around the water. Use Eye Protection: A good set of safety goggles is essential. Always wear eye protection when working with lead acid batteries or other caustic liquids such as gasoline. Also wear gloves. Acid burns. Most DIYers don't have an eyewash station so make sure you have lots of water available. If you do get acid in your eye, have enough water handy that you can flush out your eyes for at least fifteen minutes. This can happen! It has happened to me. See a doctor immediately after flushing out your eyes. David Fischer on grounding in high voltage marine systems from Bill Southworth on Vimeo. 1. Always select good quality materials. Wire, connectors, terminals, bus bars and panels should all be good quality marine equipment. This is no place to scrimp or try to save a few pennies. Remember, the most common fires on boats are electrical fires. Most are due to bad high resistance connections. Do it right! 3. Use good quality tools. A cheap crimping tool will give you a bad crimp that will loosen and allow moisture into your connections. This will cause corrosion and high resistance connections. Buy a good ratcheting type crimper. This will give you good crimps that don't come loose. 4. If you decide to solder, use good quality solder and soldering tools. Learn how to solder so you don't get cold solders. A bad solder is going to cause a bad connection. Do not use solder alone. If you crimp and solder, crimp first, solder second. 5. Seal electrical connections with a good quality sealant such as dielectric grease and a heat shrink wrap to keep moisture out. If possible buy connectors with heat shrink insulation pre-installed. 6. Use the correct size connector for the wire and use the correct size crimp on the crimping tool for the connector. This is very important. Otherwise you will get a loose crimp and the wire will eventually work free or break. Use good quality terminals that do not use wing nuts to connect the wire to your battery. ABYC says that wing nuts are not to be used to connect any terminals to batteries for wire larger than six (6) gage. Since most battery cables are 4 gage or larger, then wing nuts should not be used at all. The concern is that they will loosen from shock and vibration. When your boat is on the hard (ashore) and you are using power tools, do not power them from the boat (inverter, generator etc.). You no longer have a green grounding wire connection to ground on board. Power them from a good quality extension cord from a power source at the marina or place where you are working, or use cordless power tools. Tell the marina staff what you are doing. They can keep an eye on you in case there is an accident. Do not run extension cords onto your boat when it is sitting in the water. Would you plug in a power tool and then stand in a bathtub full of water? That is what you are doing! Use cordless power tools or power them from the on-board shore power to maintain the shore ground connection. Terminals should be ring or captive spade. Captive Spade terminals have tangs on them that prevent them from being pulled off, and ring terminals have to be lifted off. There are requirements for terminals that say they must not be able to be pulled off the connection under a specific pound pull. The amount depends on the wire size. A sixteen gauge wire must not pull off under a ten pound pull. A 4 gauge wire must resist a 70 pound pull. So use the correct wire terminals. Learn to use a Digital VOM. A Volt-Ohm-Amp Meter (also called a multi-meter) is essential for anyone doing electrical work. You do not need to spend a lot of money on this. You can pick up a good digital VOM at any home improvement or hardware store, or a Wal-Mart, K-Mart, Sears, or any store that sells tools. They vary in price from $12.00 USD and up to several hundred. But all you really need is something to measure voltage, amperage, resistance, and continuity. Any multi-meter will do this. I have an inexpensive one by Cen-Tech that I can carry in my coat pocket that does the job just fine. It cost about $13.00 USD new. I bought it used for $5.00. For testing AC circuits a receptacle tester is a very good tool to have. You simply plug it in and the lights tell you if the circuit is good, whether there is a ground fault or reverse polarity, or if the circuit is dead. The last is vitally important if you are working on the circuit. I have seen these for as little as $8.00 USD. A great item to have for testing AC circuits on a boat! I picked up one free as a giveaway at a boat show.